I can't believe I haven't posted all month. I blame the change in weather. Coupled with all of the family sadness, it just makes me want to stay in bed under the covers forever. On the upside, before when I wanted a 'rest day', I had to drag my pillow and comforter out to the couch. But now I have a big screen TV and a TiVo in my room, so I can stay in my nice comfy, warm bed! I have been writing - 4K so far this month, which isn't a lot for me, but this year has been slow and 4K is still twice what I wrote last month. And all 4K has been on one fic - a Monster Squad fic with a John Winchester cameo. It's a kid-fic (or kid-ish, as it has the same sort of language that The Monster Squad did). The Nephew and I watched TMS together last year, as it was a big favorite of his dad's as a kid and a must watch for me every Halloween since I was able to secure it on DVD. TN loved it and I started a fic for him then, but Real Life interfered and it didn't get finished. So I'm finishing it this year. Idk if he'll even realize that the guy in it is meant to be John Winchester but that's okay, it's still funny to me. Plus, since TMS came out in the late eighties, it's actually perfect for John as a hunter to be crossing paths with these kids. 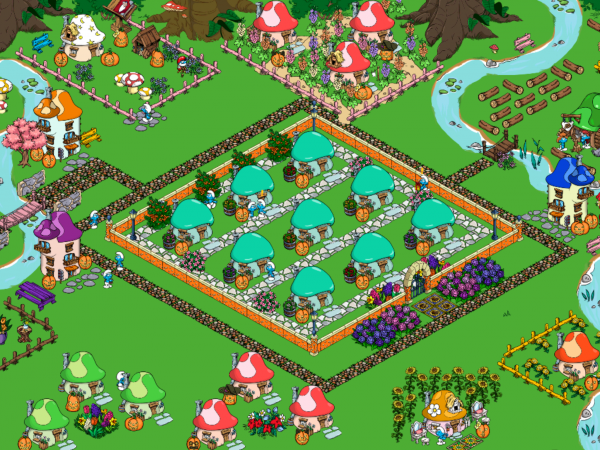 Another thing I've been filling my time with is playing Smurf Village. I've had the app for about a month. 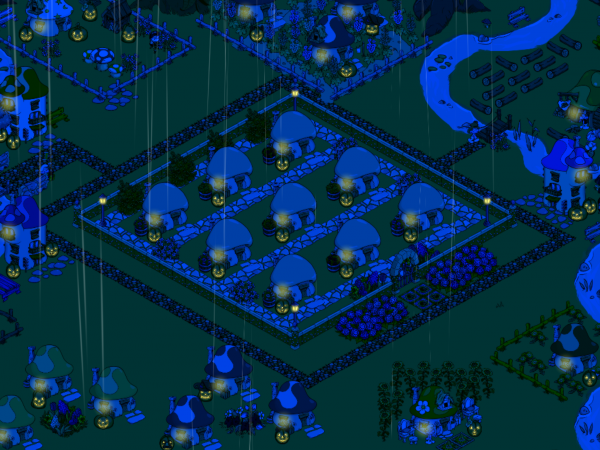 My sister plays Sim City on her phone, but I was like, "If I'm building a world, I want it to be a smurfy world!" It's fun! It not only has the world building aspect to it, but also mini-games to play for extra coins/xp, as well as side quests - like Gargamel is casting a spell to reveal smurf village, so go to Papa's lab and make a potion to counteract it, or the smurfs are getting bored, so Papa asks you to place a fun object in the village for them to play with. So far I have an entertainment district, a suburb with a gated community, farmland and a secluded mine area. I also have found the island and am building there and the mountain-top, though all I let my Smurfs do on the mountain is dig for treasure for me. It's kind of creepy how there are so many clone smurfs and they are the ones who have to work the field. I feel like Papa Smurf might be a communist dictator. 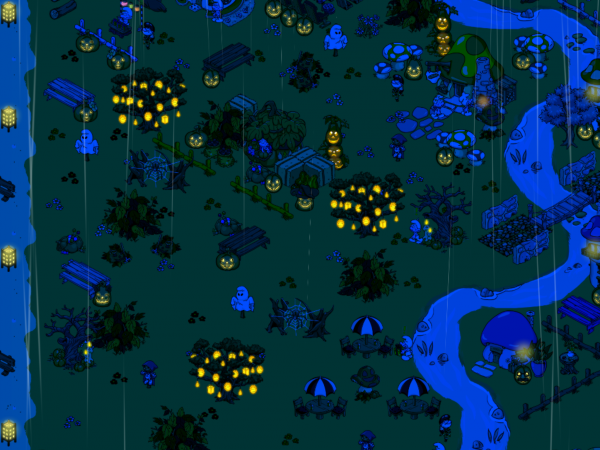 As you can see, it was raining on Smurf Village this evening. I am reading my Flist regularly and one day, I hope to actually reply to comments. But in the meantime, I'll be over here, trying to get enough money to upgrade all my houses in my gated community! Love you, miss you, finally wrote something (short) after four months. Hey! Just touching base! Wasn't sure if it was better to do here or via text, but here I am. How are You? Writing? Still doing the dance/burlesque stuff? How's school going this year? Love you too! Dancey Dancey! I worked a show last night and am stage managing one this coming Saturday. I also have submitted acts for future shows. Wrote some for NaNo, and am still trying to increase that time. I find myself staring at the TV when I could be writing AS I'm in the room with the TV. Bad VP! School has been fast and weird. The children are a lot like wild animals this year - the freshmen class doubled in size and I think if they were cats they would always go outside of the box just out of spite. Sadly the fact that I'm teaching mostly seniors isn't all that much better!